Stumbling upon tiny Galien can feel a bit like going back in time, but the town very much has a modern sensibility. 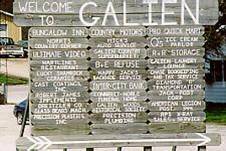 Locals will be quick to correct you if you mispronounce the name (it's pronounced Ga-leen). Named after a nearby river, Galien can be traced back several hundred years to Rene Brehant de Galinee. This French explorer and priest worked as a mapmaker for area missionaries in the late 1600s. The town itself was settled in the 1850s by George Blakeslee, who operated a sawmill and general store in town while serving as postmaster, justice of the peace and village president for many years. Like many towns along US 12, Galien was dependent upon rail commerce until increasing traffic along the Sauk Trail connected the community to the growing interstate automobile culture. The trains merely rumble through now, but the original train station still stands as a prime example of turn-of-the-19th century rail architecture. Today Galien is home to farm market and U-pick orchard Springhope Farm and the Southwest Michigan Buttery, purveyors of all-natural fruit butters. You can pick up a jar for yourself and grab a bite to eat or a hand-dipped ice cream cone at Aiden's Place, located in an historic storefront in downtown Galien.